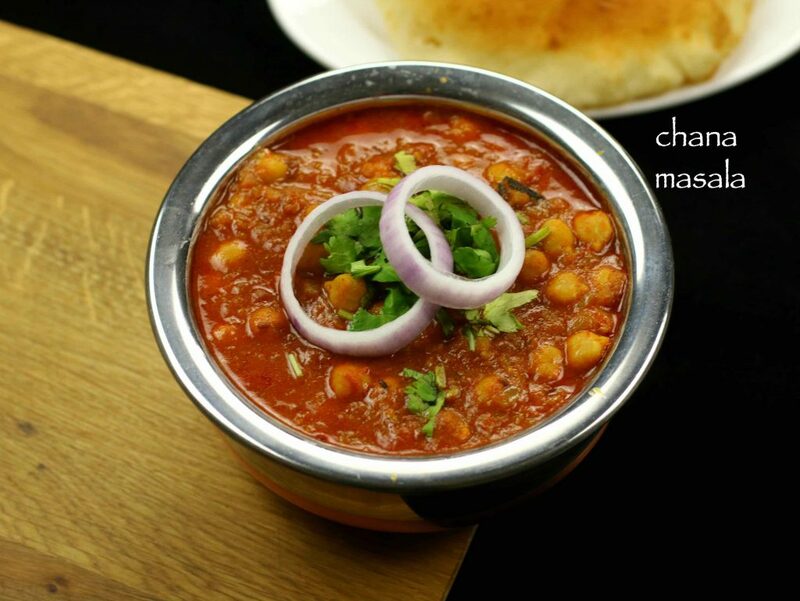 chana masala recipe | punjabi chole masala recipe with detailed photo and video recipe. basically a spicy chick pea curry prepared with finely chopped onion and tomato. it is usually served with bhatura or puri but not restricted to try with roti or paratha’s. 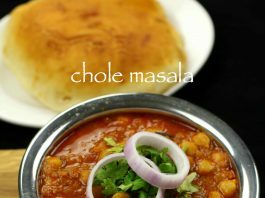 chana masala recipe | punjabi chole masala recipe with step by step photo and video recipe. it is a popular north indian curry recipe which is widely appreciated all over india. 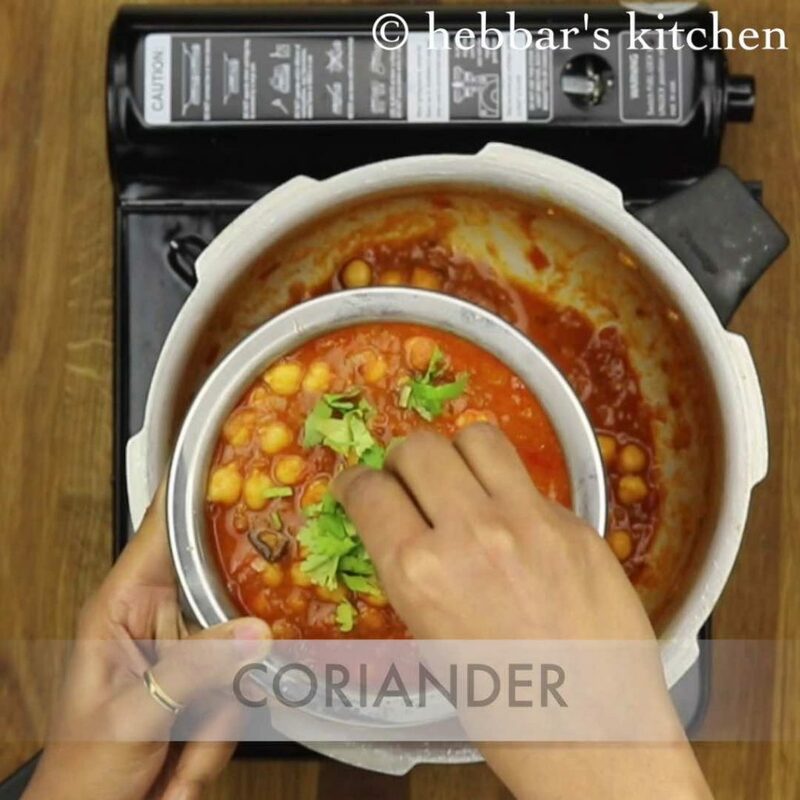 the main ingredient for this exotic curry recipe is chickpea or chana which is pressure cooked with onions and tomatoes. 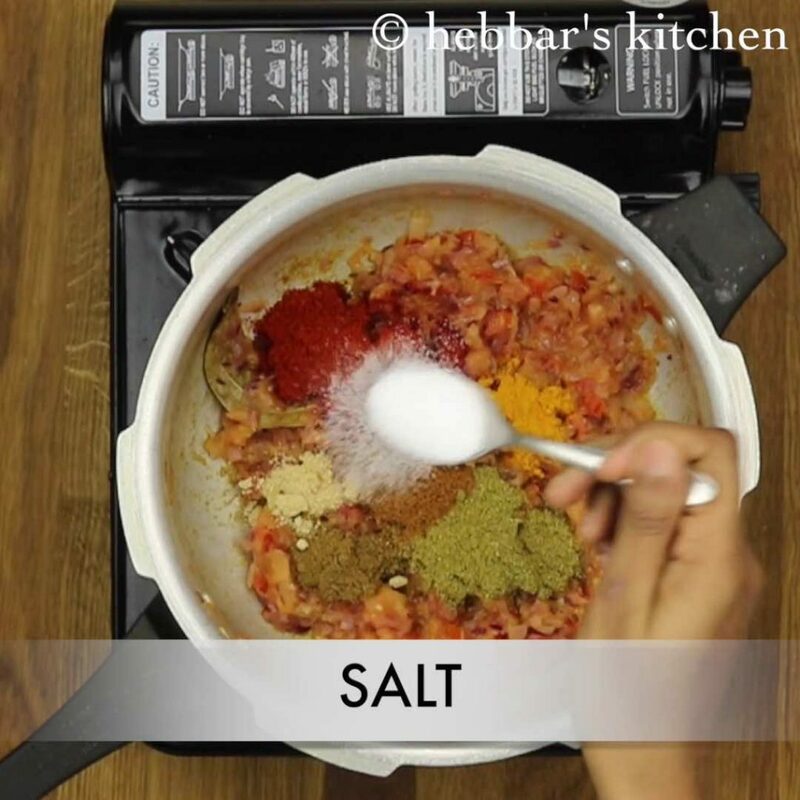 not to forget the indian spices added before cooking this amazing recipe. well, my love to chole masala recipe resides deep within my family roots. channa masala recipe is one common thing which we share across all our family members. perhaps the taste for this exotic dish must have been started from my grand father. however, it tastes heaven with bhatura recipe. i prepare this quite often with canned chikpea which is semi cooked. basically it does not require the soaking step and directly pressure cooked. 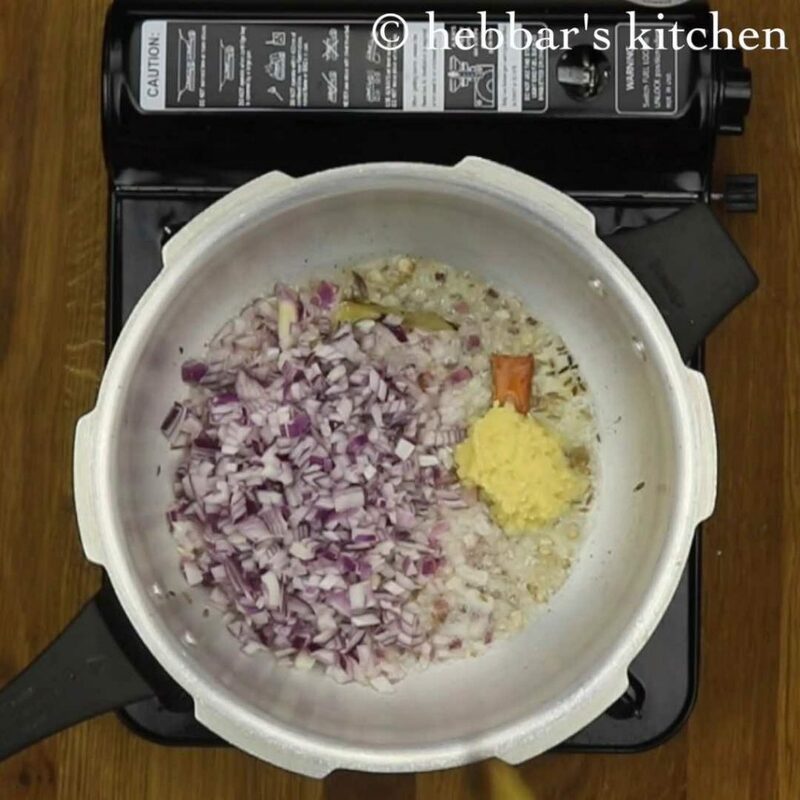 however, in this recipe i have followed the traditional way of making chole masala. furthermore, i would like to highlight some key suggestions for perfect chana masala recipe. 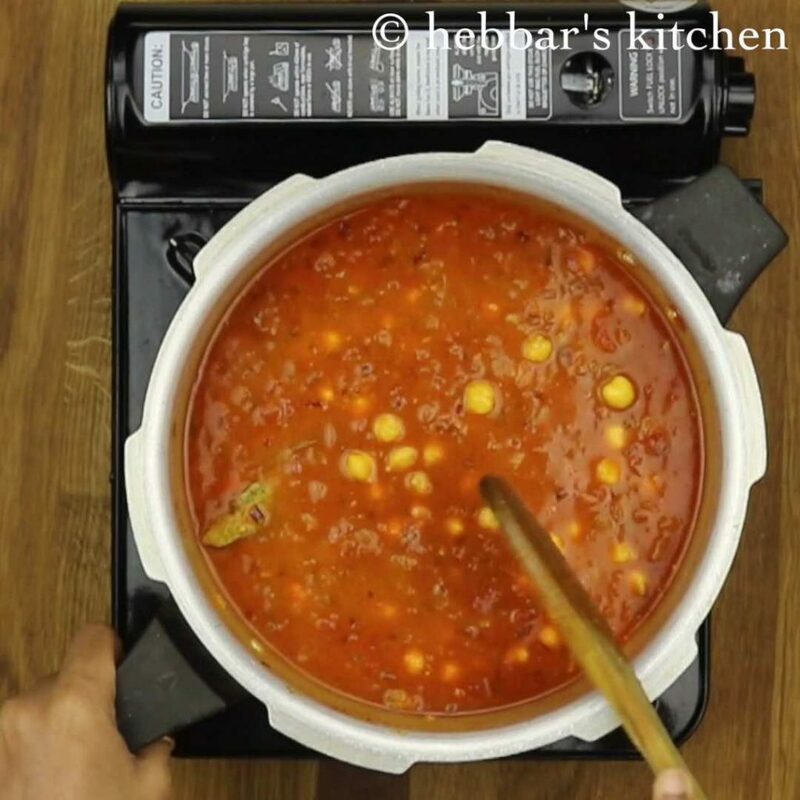 firstly, soak the chana for minimum of 4 hours. otherwise, you may feel chole masala not cooked properly. secondly, you can add store bought chole masala powder for this recipe. but skip adding spice powders like coriander, amchur, cumin and garam masala powder. 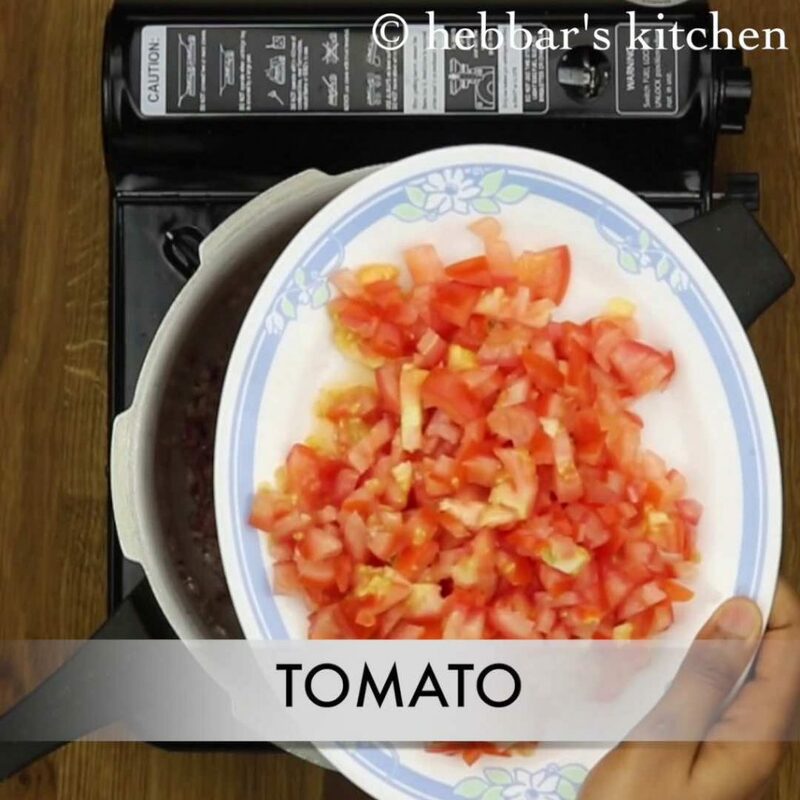 thirdly, try to add ripe tomatoes for this recipe, as the curry will turn juicy and tangy. 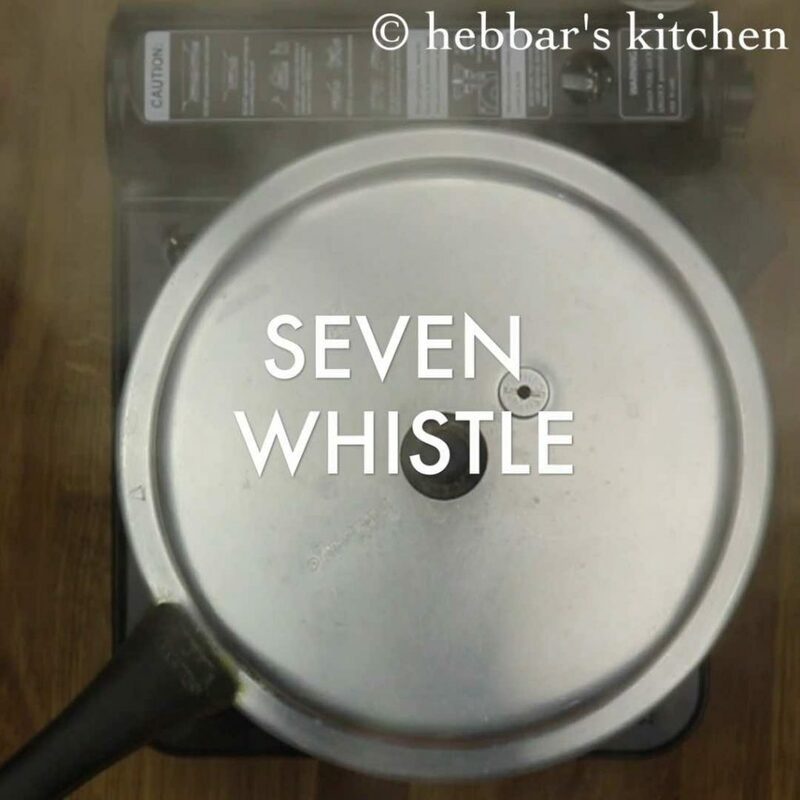 lastly, pressure cook the curry for a minimum of 7 whistles. otherwise, the chana would not cook properly and perhaps half cooked to spoil your taste. finally, i request you to check my other indian curry recipes collection. particularly, paneer tikka masala recipe, paneer kadai masala recipe, palak paneer recipe and malai kofta recipe. in addition, do visit my other indian roti recipes collection and indian paratha recipes collection. especially, poori, garlic naan, tandoori roti, bhatura and rumali roti recipe. firstly, in a cooker heat oil / butter. 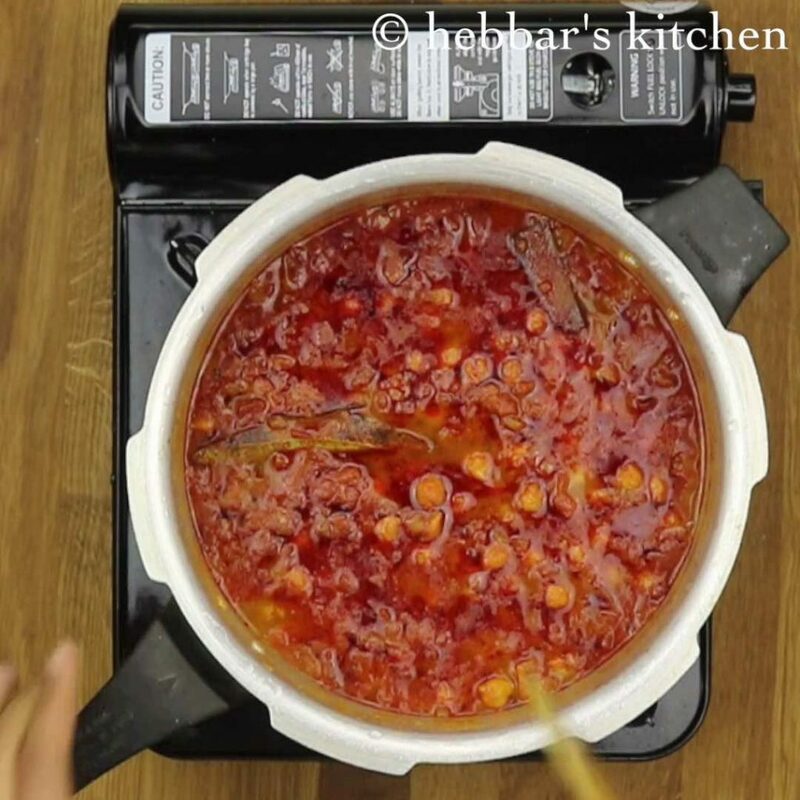 using more oil makes dhaba style chole masala. furthermore, saute bay leaf, cinnamon stick and cumin seeds till they turn aromatic. further, add chilli powder, turmeric, coriander powder, cumin powder, aamchur powder, garam masala and salt. saute for a minute. further add 2 cups of water. add more water if you like it to be more gravy. give a good mix. and check the seasonings. 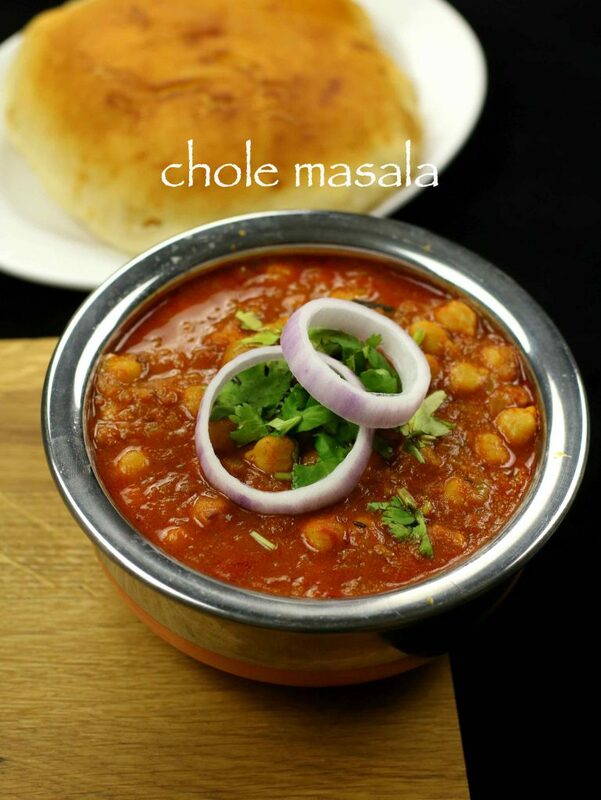 make sure the masala water to be slightly salty as chole will absorb while cooking. finally, serve hot with poori / chapathi / bhatura. firstly, soak chickpea / chole overnight. else they wont get cooked well. moreover, squeeze some lemon juice just before serving. it taste great. 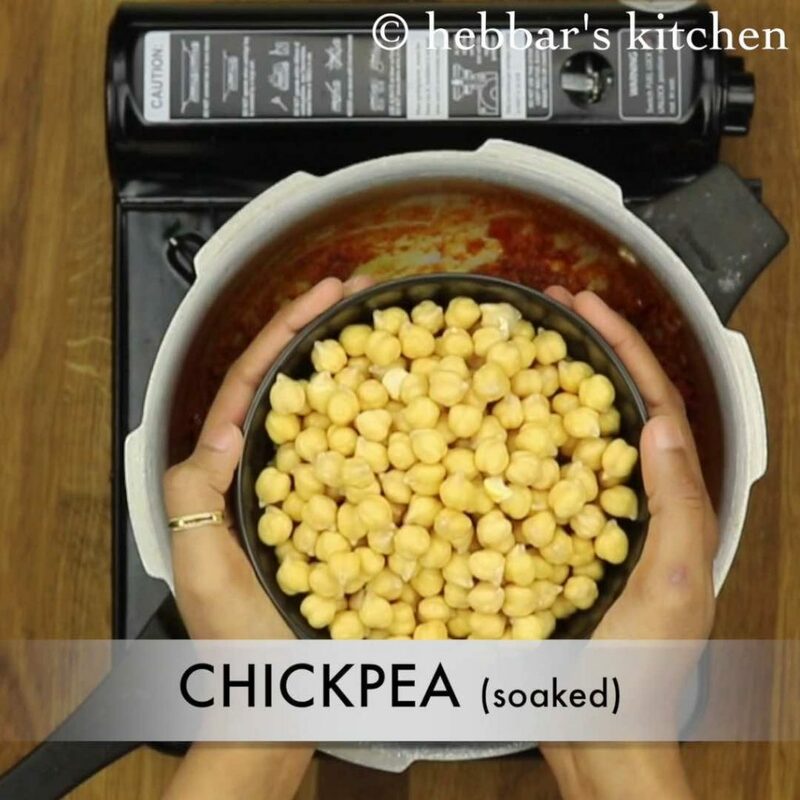 furthermore, use canned chickpea to avoid soaking process. also, adjust spices to your spice level. finally, mash few chole to make thick gravy. For how many hours the cheakpea is to be soaked? My Mom just cooked it today and it was a bang on. I don’t have aam chur is there a substitute for it? you can squeeze half lemon at the end.. I wanted to post this from a long time. I have been following your recipes for the past 6 months and all of it is simply amazing. I like how easy you make the whole cooking thing look even for beginners. Once again thanks a ton and please keep posting more new and interesting recipes. I love u recipes n i like to do more offen. In dis recipe u have mentioned on top if description not to add garam masala, aamachur n cumin n coriander but while in d cooking process u have added can u let me know weather i need to add or not for yummy taste. if you add store bought chole masala, you can skip all those..else you need to add all those.. I am following your website for quiet sometime now… I have seen few other cooking websites too.. but, one thing I like the most in your site is simplicity.. (way you cook…. 🙂 even those dishes that seems difficult is made easy without compromising on taste..) of the dishes.. I have tried couple of recipes and all have come great…. But your website has helped me tryout new and tasty dishes even on weekdays… I am no more feeling guilty … 😛 my hubby is enjoying the food..
We made this and it turned out to be really yum! and ate lots off us so tasty and yummy. I am not sure how I will manage my daily cooking if Ur app or site becomes unavailable! Thanks a ton, you are the only food website I trust, others mess up in their measurements n make things complicated. I am just short of words to describe how amazing this recipe was. Everyone loved it, thanks so mucj for this wonderful recipe. i have already boiled the chickpea separately.is it possible to make the gravy and finally add the chickpea in it like how we do for other dishes ? yeah you can prepare with boiled chickpea.. simmer in gravy for atleast 10 minutes, to absorb spices. Tried it..yummy.everyone likes this recipe in home.thanks for the recipe. Yummy…can u plz tell me how much chole cook finally…as my pressure cooker take quick whistle and food does not cook so whistle idea does not help me. 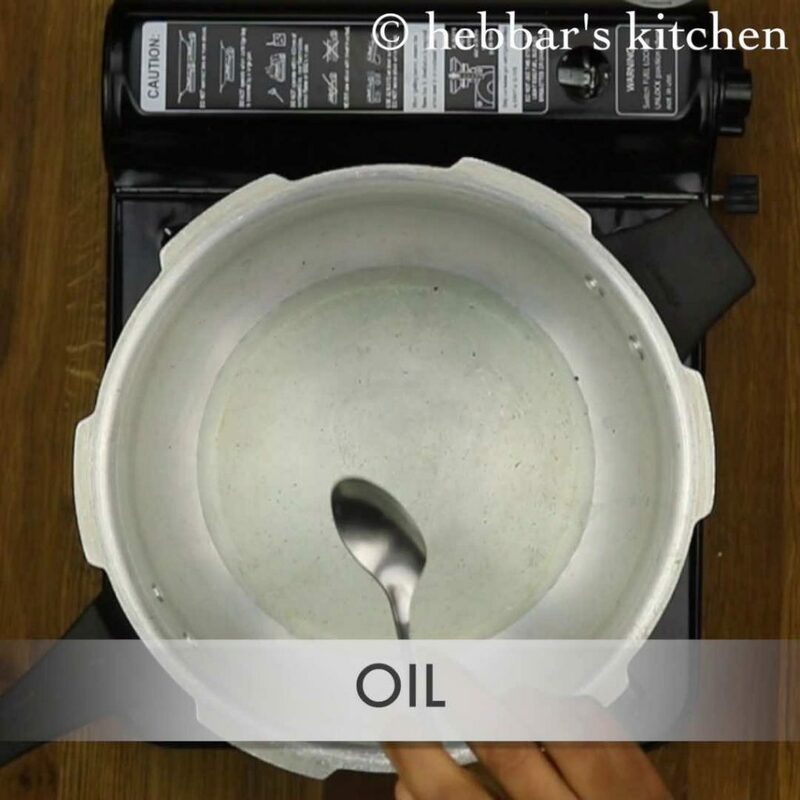 approximately it would be similar time to cook the rice in cooker. I’m a passionate cook. Just love cooking for friends and family. Your recipes have come to my rescue quite a few times. Thanks a lot. easy and v . nice recipe.. Respected Sir / Madam, Thanks a million for all these easy recipies coz they r really very useful n with the step by step video its a kinda piece of cake to make them when i actually thought that they required a hell a lot of prep n u ppl have made it very simple to view n understand n hence the cooking goes faster. Thanks n God bless all those involved in bringing this to us mothers n helping us save time. Take care n plz keep up the good work. Maria Smith. Bangalore, Karnataka. 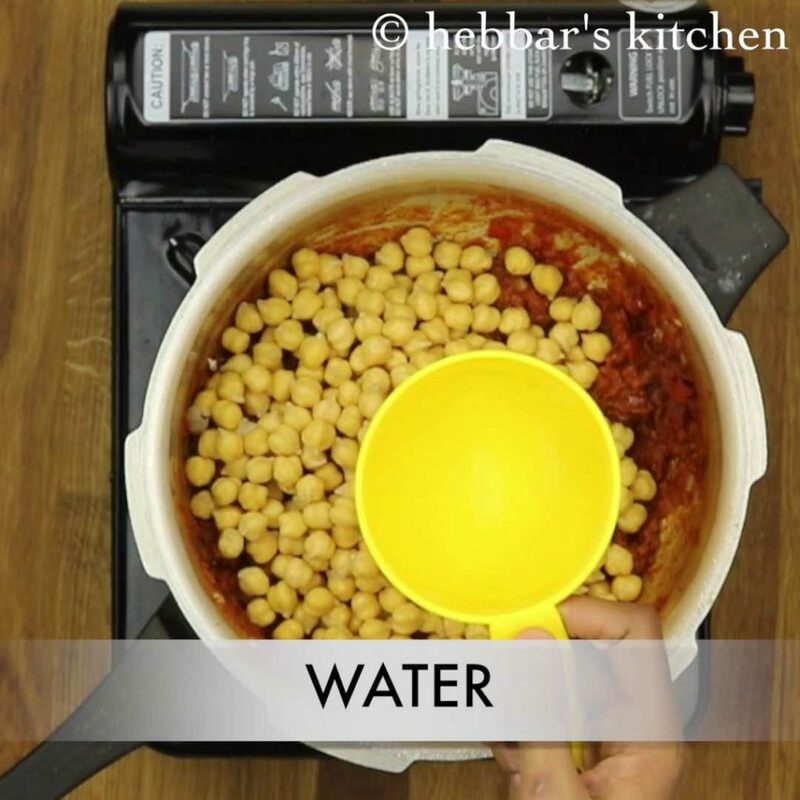 very nice recipe… my query is ,, can we precook the chickpeas in a pressure cooker before we mix it in the gravy…. 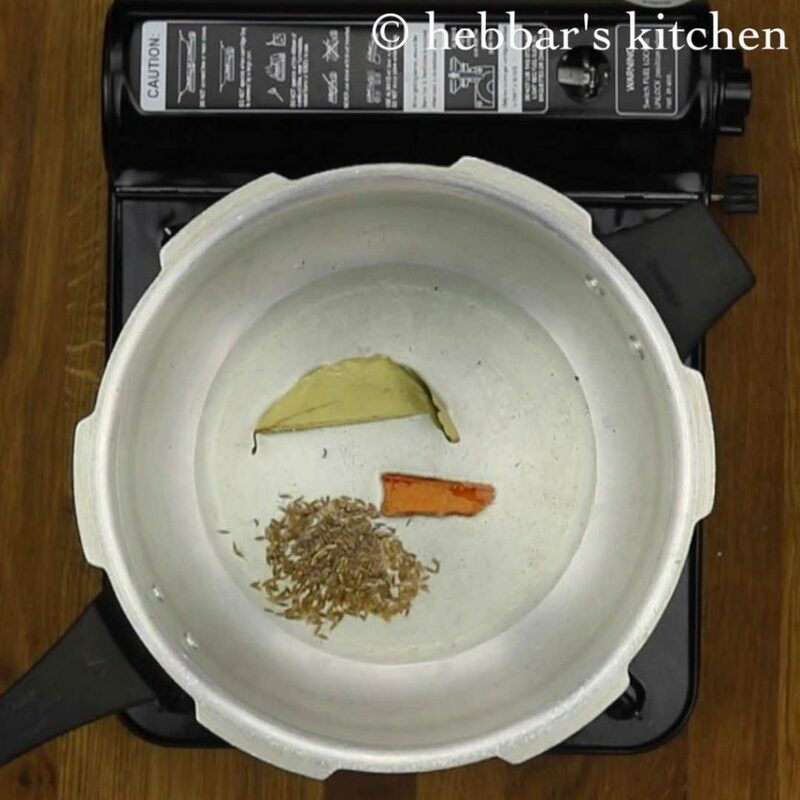 you can but I would recommend this way as while pressure cooking the chickpeas with spices, it will absorb it and tastes better. I want to know…that in some dhaba’s they make punjabi chole masala with black gravy and very tangy taste .How to do that? I will try to post it soon. Thanks a lot Abhishek. This is the first time am writing my comment in ur blog…I tried this for a get together at home…it was very tasty…all guests had and the next day few were calling me for the recipe… Thank u so much…well advance can make and keep aside for house parties.